Back in 2010 BMW officially launched an iOS app on the Apple Store that lets Apple device owners to perform a number of functions without even touching the dedicated buttons present inside the car. While Apple device owners have been enjoying the benefits of this amazing app for 2 years, BMW owners having Android operating system based devices were deprived of the app as it was under development. Yesterday BMW officially announced the My BMW Remote app for Android device owners and now the app can be downloaded for free from Google Play (Google Android Market earlier). 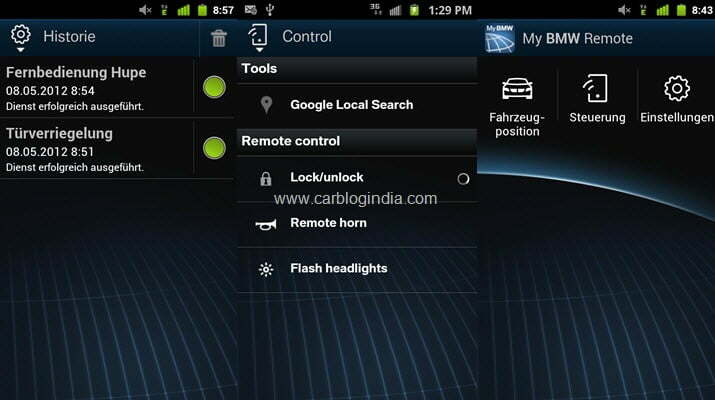 “Remote Door Lock & Unlock” allows the car to be locked and unlocked from a smartphone. “Climate Control” makes it possible to control the interior temperature by adjusting the auxiliary ventilation and heating settings, and programming the systems by timer. With “Horn Blow” for sounding the horn and “Flash Light” for briefly switching on the exterior lights, users can trigger acoustic and visual signals to help them find their vehicle in crowded car parks, for instance. · If the car is out of sight and hearing distance but within a radius of up to 1,5 km, the “Vehicle Finder” function is able to display a map on the smartphone screen showing the way to the vehicle’s location. This function is only available when the ignition is switched off, thereby making it impossible to track the vehicle’s movements. Finally, using Google Local Search, users are able to import points of interest (POIs) from their smartphone into the vehicle’s navigation system via the message list. 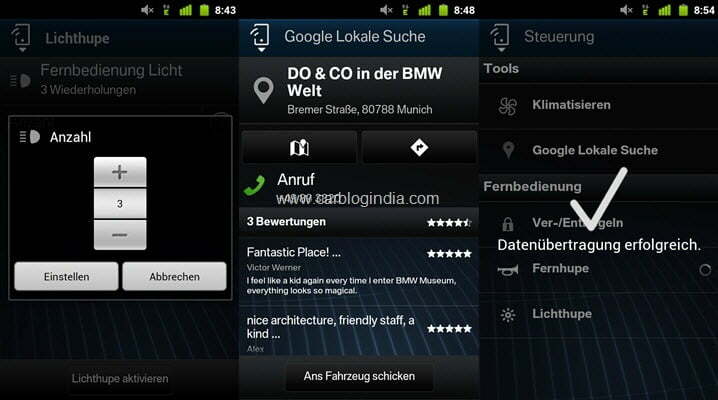 The app can only be used by BMW owners having an active BMW Assist contract. So if you do not have an active connection, you can apply for one by going to the official BMW website. Seems like we are fast approaching the Future cars which we imagined for the year 2020.